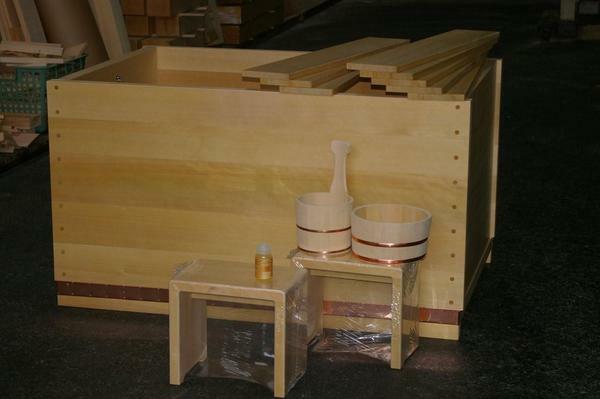 Blog | Bartok design Co. Blog – Page 46 – Bartok design Co.
hinoki tub ! SEPTEMBER SALE ! 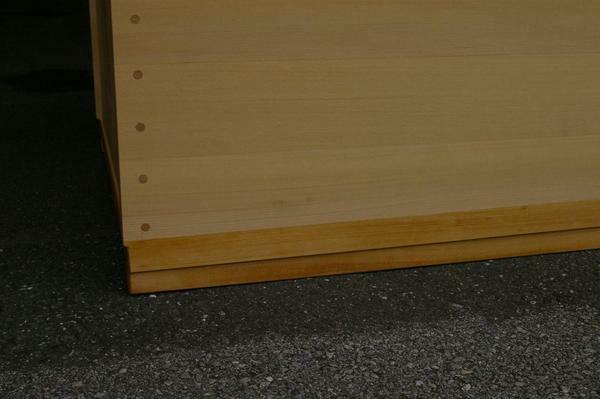 Did you contact us some time ago with reference to a quotation for a japanese tub? Is your project still on track? Or did you just knew about us and wish to have a quote? 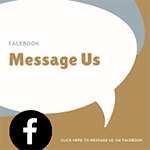 We are at your disposability for any question/problem. There will be an extra 3% discount (10% total!) for the first 3 tubs ordered in september. This offer starts today aug/25 and expires sept/30/2009 at 18:00 JST. * This offer cannot be cumulated with other discounts. * This is Bartok design`s first promotional sale. * We do not have plans to make it a regular feature and in case it will be repeated it will not be before august 2010. * These conditions include a governamental 5% tax facilitation. I can not thank you enough for taking the time to respond to my e-mail. I will use the information that you have provided to repair my friends tub. If I am unsuccessful, I will be coming to Bartok Design for a new tub. I will let you know how my endeavors turn out. You have been very helpful, and YES, I would be pleased if you placed my question and your answer on your website. I have spent many hours looking over your site and I’m sure that I will spend many more. It reminds me of the time I spent in Kyoto working with carpenters building tea rooms (chashitsu). Thanks again for your help and professionalism. 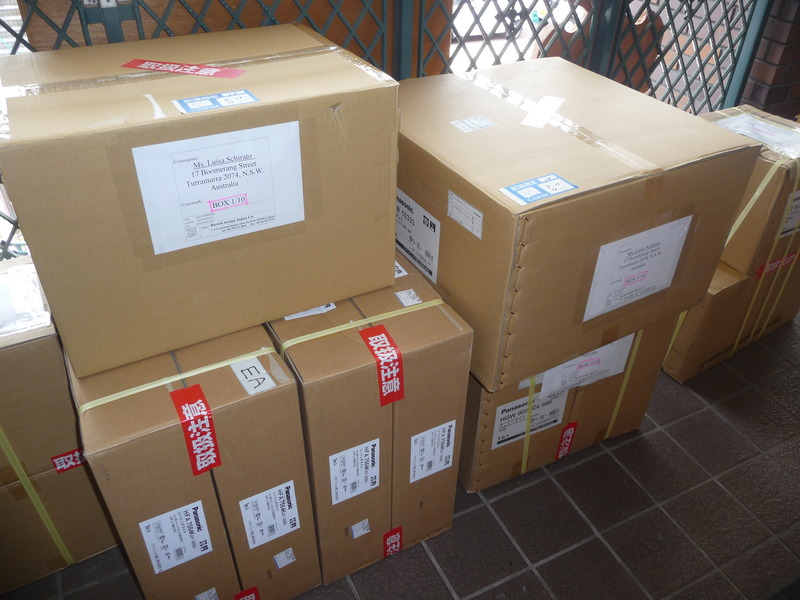 We received a mail from our previous hinoki-bath customer. Now she wanted to complete her renovation with japanese style lighting fixtures. The japanese maker of course cannot offer support or guarantee overseas and we had to ask our client to sign a liability release paper. 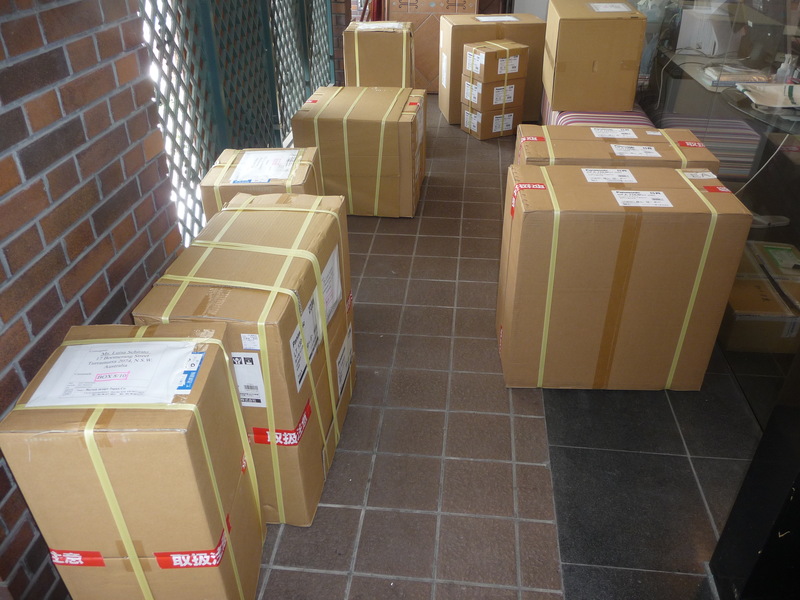 Since we are a japanese company we can purchase at 50% off listed prices and transfer this advantage to our clients. Sales conditions vary case by case according to the quantity, makers and products. Some items are order made and may require one month or more for production. Feel free to contact us for any question. 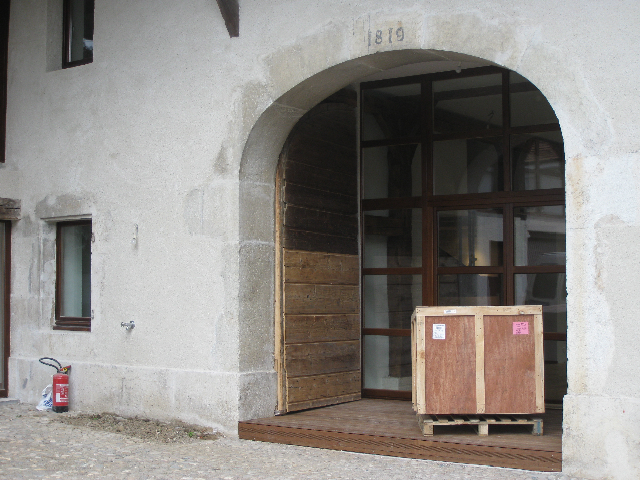 First the arrival in front of a renovated ancient barn…how charming! Lastly, a regenerating view on the garden. A perfect mix of eurpean and oriental sensations! 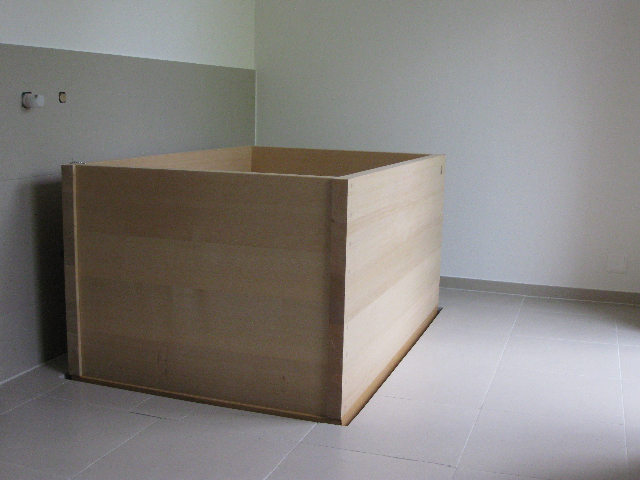 We love our hinoki tub that you built and that was installed in our home about a year ago. 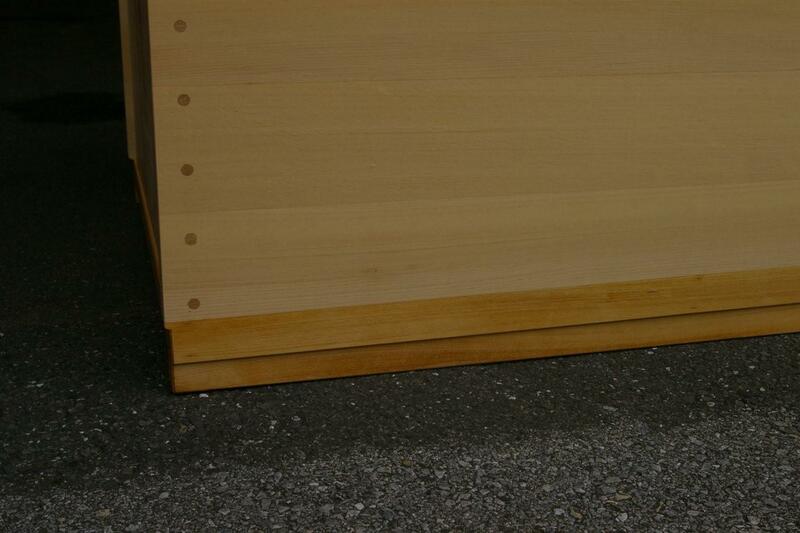 The tub itself is fine, but the wooden slats on top have developed mold. Is there anything we can do to get rid of it? 1) apply a small amount of bleach on a dump cloth and friction the mold spots. An old bath towel should be fine. 2) wipe immediately with a clean dump cloth. 4) rinse abundantly with the shower while wiping with a cloth to remove any bleach left. This treatment does not harm the wood if you do it few times a year. Also, I recommend to turn over (upside-down) the planks from time to time. 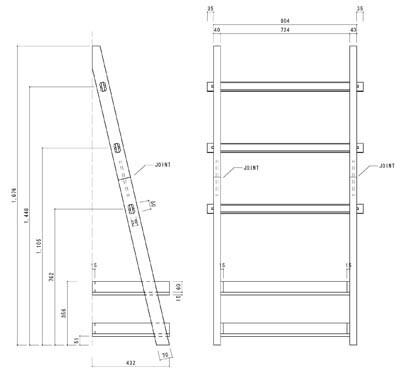 This prevents the formation of mold and warping of the planks overtime. In case you do not want to use the bleach or if it has scarce effect, the standard solution would be to use a planer. Also fine sand paper will do the job. Let the wood dry well and use first fine paper (#240) to remove the wood skin. Finish with very fine paper (#400). Reember to follow the direction of the wood veins. Please let me know if it worked out. The tub is equipped with a traditional cover and bath accessories. We kept in touch with the client for about a year …Yes, sometimes takes time to find the best solution, don`t be afraid to consult with us from the first stages of your project. Luckily we could solve the situation with a luxury detail: we removed the copper and planed the edge to completely remove the indents of the nails. Then we inlayed a base molding and treated it with natural oil. 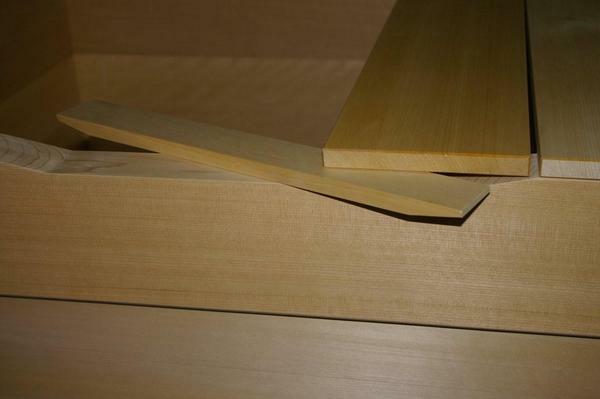 It is a lot of work but it was worth it: the base molding hides the joints of the bottom plank and its exposed face is naturally resistant to water being the wood grain parallel to the cut. As the proverb says, Every cloud has a silver lining! The shipping company phoned, and our Bathtub has arrived ! it will be delivered next week on 14th of July! French national day, but the swiss do not care…. 😉 For us, this week would be too early as there are still some work to be done in the house; they were OK to delay teh delivery, but I hope it’s no problem for the tub…? “Unfortunately”, they had to remove the plastic cover, overwise they wouldn’t have been able to carry it (too slippy…) and set it properly in place. I say “unfortunately”, because our tap has not been installed yet, so that we cannot take a bath! Anyway, to follow the instructions, we filled it with water from the garden, and empied it a few hours later. 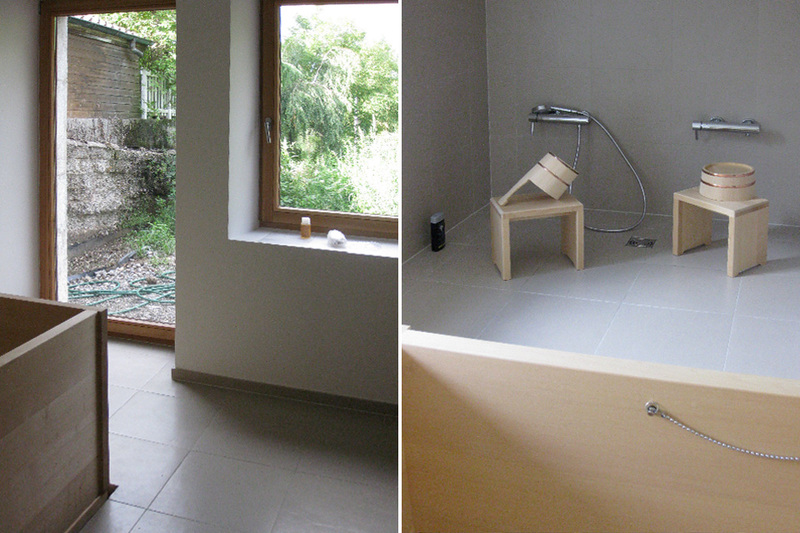 In addition, we’ve been using the nearby shower every night, and I suppose it brings humidity arround (?). 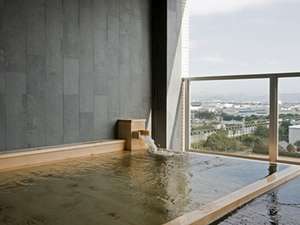 Otherwise, we are very happy with our Bathtub and the meantime, we simply enjoy its beauty and its good smell !!! As for the accessories, they are also very nice indeed! The badtub was delivered to us on Monday. Following your instructions we haven’t opened yet, but the size and form is perfect for us. We are looking forward to have it installed and enjoy it. I thank you again for your help and good service! 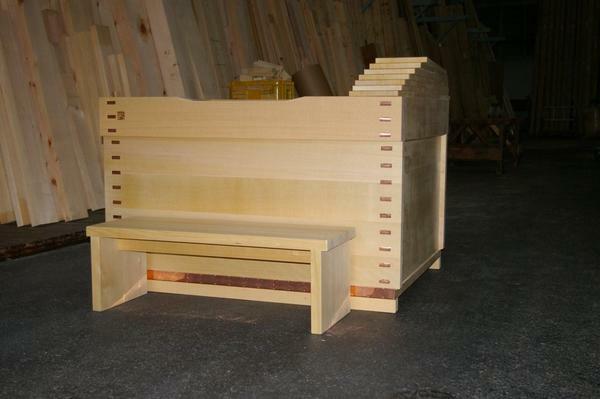 We received the request from a previous customer of custom bath accessories to match an asnaro tub. 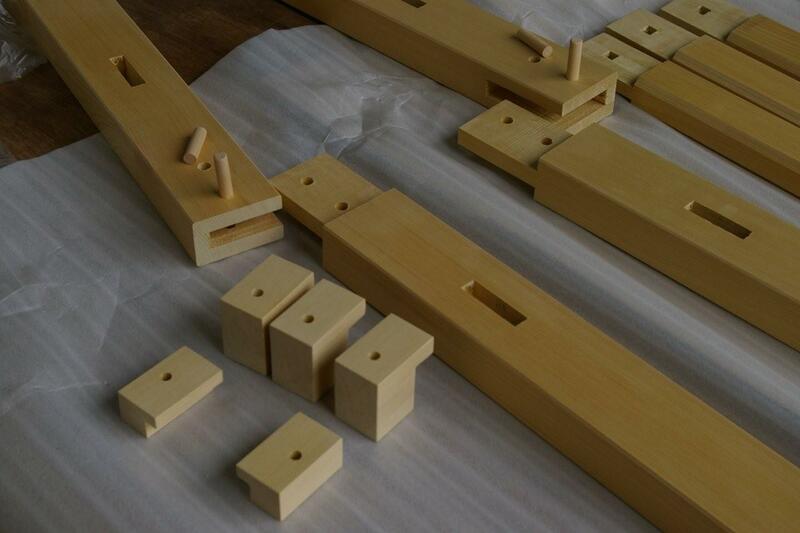 We received precise information and could elaborate it to include traditional japanese construction details. The small parts in the picture are door pulls and robe hooks. 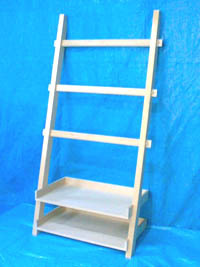 The “towel ladder” is divided in pieces for an easy assembly on site. This allowed fit within the set sizes for postal parcels. Using EMS mail for small shipments is fast, cheap and without fuss. 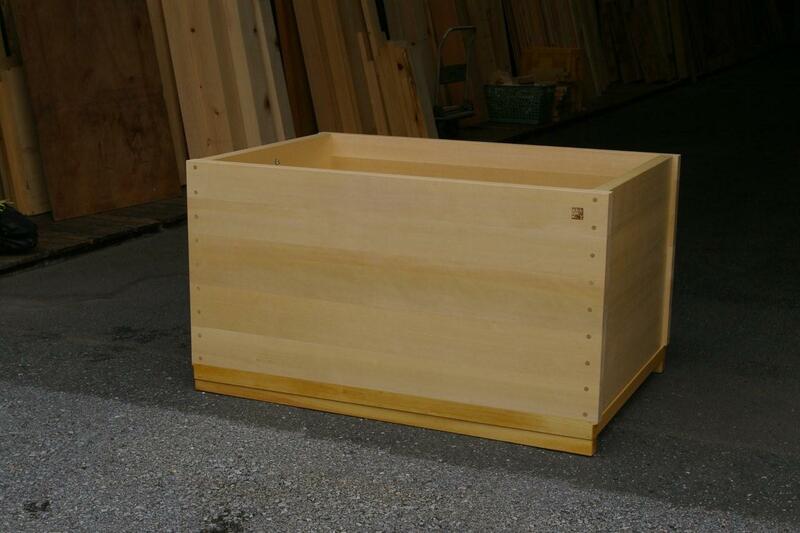 This tub is going to be used in a therapeutical facility. As it is very wide, it can be used also by two people facing eachother while fitting in a compact space. It is finished with copper apron, wood dowels and -yes- it a has a very nice top frame as anticipated in our blog. The tub is also equipped with a tub cover and a step-bench. 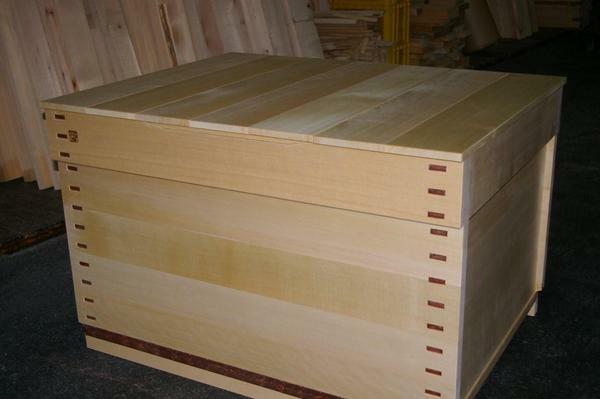 Here is the tub with its cover (traditional type in separated planks.) Note that the color of the planks appears different but this is accentuated by the effect of the flash. The tub is equipped with a cut to redirect the water overflow towards an existing shower. We are also providing a matching piece of wood to close this gap while the tub is covered.